Many pressure sensor applications in rugged environments such as aerospace, automotive, industrial, and even medical equipment present developers with conflicting requirements that lead to expensive compromises. These sensors are often used to measure pressure, level, and flow of harsh fluids such as gas, oil, refrigerant, or other caustic solvents that can damage the sensor element. Extended temperature requirements offer additional challenges, even beyond compensation for accurate pressure readings. Automotive and aerospace specifications are especially stringent, with operating temperature ranges as broad as ‑40°C to +150°C. And these rugged applications typically have high reliability and accuracy requirements, since component failure can lead to product recalls or safety risk. To respond, equipment manufacturers rely on expensive ongoing maintenance and component replacement to work around the sensor’s inherent short lifespan. The packaging of the sensor component is critical in solving this issue, but is a challenge that has, until now, eluded sensor manufacturers. Consider a typical use case. An automotive application such as gas or diesel fuel-line sensing requires a sealed sensor element that can be installed inside the fuel line to detect pressure changes that indicate a plugged fuel filter, which provides a feedback signal to the car’s computer to notify the driver. Similar requirements occur in airplane engine, gear, and valve controls, and in measurement and control of compressors or leak-detection systems in industrial equipment. While medical applications may not require the pressure sensor to operate in fluids as harsh as gasoline, even saline solution can be corrosive over time, and the cleaning and sterilization process often requires repeated contact with caustic chemicals such as bleach. The problem is that the adhesives that are used to create the pressure seal and protect the sensor die and related circuitry eventually soften in harsh fluids. Once the seal breaks, the sensor circuitry is damaged, creating a common reliability failure that can be expensive if it causes a product recall or demands regular maintenance and replacement of the sensing subsystem. Extended temperature requirements increase the packaging challenge. While some new adhesives may withstand higher temperatures than was possible in the past, they still risk die detachment at pressures of 300 psi, and humidity can destroy the bond strength of most adhesives. There are exotic epoxies that can withstand some temperature and humidity extremes, but storage and application raise additional manufacturability issues, and these epoxies can impact accuracy of the sensing element in extended temperature applications. For a pressure sensor to perform well from ‑40°C to +150°C, it requires a stable MEMS element as well as stable packaging and manufacturing processes. But instability typically occurs because of differences in the thermal coefficients of expansion (TCE) of the MEMS die and the substrate on which it is mounted. Stainless steel might be considered an ideal substrate, but its TCE is much higher than that of silicon. As temperature changes, the metal expands and contracts while the silicon elements soldered onto it experience much smaller changes. The MEMS element reacts to the stresses caused by the TCE differences, triggering errors that look to the system like pressure changes—presenting system designers with a new reliability issue. An innovative new pressure sensor packaging approach creates a eutectic die bond on ceramic substrate using a gold-tin soldering alloy for a hermetic seal even in harsh fluids, at high pressure, and at extremely wide temperature ranges. The ceramic substrate has a TCE that is close to silicon so there’s no significant thermal mismatch, and gold and tin are common soldering elements that hold up well to harsh fluids. While their high individual melting points can impact manufacturability, a gold-tin soldering bond with an 80:20 ratio creates an alloy with a much lower melting point, which improves manufacturability while still maintaining the benefits of both metals in harsh environments. And while this gold-tin solder is more expensive than adhesive, the cost differential is minute in comparison to the significant improvement in long-term reliability and maintenance costs. Table 1. 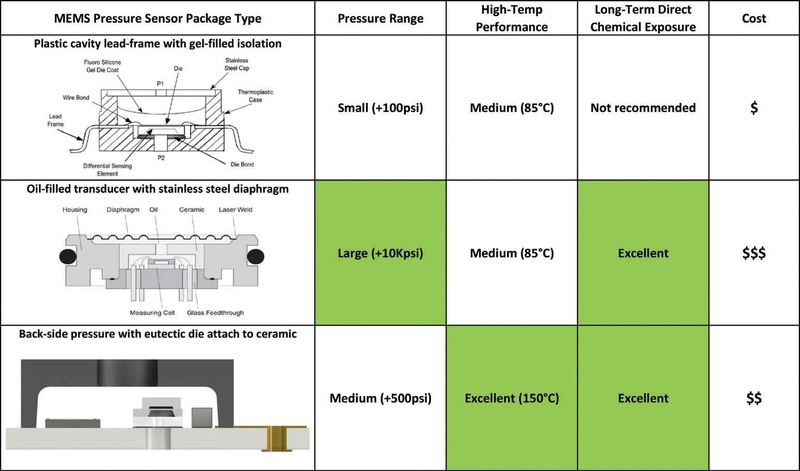 Comparison of pressure sensor package types across harsh application requirements. An additional element to consider in comparing sensor packaging approaches is whether the pressure media comes in at the top or back side of the sensor. If the pressure is on the top side of the sensor, the circuitry must be protected from shorts or corrosion, which is typically accomplished with a protective gel. But a gel that is stiff enough to withstand corrosive fluids and high temperatures can also be stiff enough to cause stress to the MEMS element, which, again, generates sensing errors. In contrast, back-side entry exposes only the silicon, glass, and the eutectic die attach to the pressure medium—and these elements have been proven to withstand these harsh environments. System developers who require pressure sensing capabilities in harsh-media, extended-temperature applications have discovered that packaging is critical to improve product lifetime reliability and reduce cost of ownership. It is a challenge that has finally been solved. Scott Sidwell is sensors engineering manager for Merit Sensor Systems. He can be reached at [email protected]. For more information, see https://meritsensor.com.